Today we’ll discuss how to recognize the signs and symptoms of dehydration – a potentially life threatening condition. The inadequate intake of water e.g. lost in a desert, shipwrecked at sea without fresh water and painful oral and throat infections causing reduced fluid intake. The excessive loss of water due to excessive urine output e.g. uncontrolled diabetes. The excessive loss of electrolytes. Common causes include: severe vomiting, diarrhea, and excessive sweating due to long periods of physical exercise or fever). Excessive vomiting, diarrhea, sweating and urinating. Dryness of the mouth and other mucous membranes. Reduced (or absent) urine production. Concave ‘sunken’ fontanelles (soft areas on a baby’s skull). Loss of the skins normal elasticity. This project will describe a technique to test the elasticity of the skin. Examination gloves (optional for self examination). The necessary instruments are included in The Apprentice Doctor package. Important note: An intense thirst is usually the result of the loss of water from the body. The loss of large amounts of electrolytes may not cause a thirst at all! STEP 1 Take a thorough medical history. 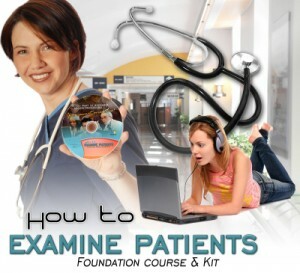 Use the medical file in the Foundation Kit for this purpose. STEP 2 Wash your hands and put on gloves. STEP 3 Place your hand or a test subject’s hand open on a flat surface e.g. a table. STEP 4 Pinch the skin over the upper part of the hand firmly for about 5 seconds, and then release the skin promptly. STEP 5 Observe the skin sagging back into position. This should happen straight away as you release the skin. Skin sagging back slowly (taking more than half a second) is a sign of dehydration. STEP 6 Check the test person’s blood pressure (Project 31) and heart rate (Project 24). Dehydration may cause a reduction in the patient’s blood pressure as well as an increase in the heart rate. STEP 7 Examine the test subject’s nail bed (Project 18) and assess the speed of capillary refill (blanching). In dehydration the capillary refill after pressure may be slow (more than half a second). STEP 8 Check for diabetes and kidney disease (see Project 40). A thorough understanding of human physiology and of pathology (the branch of medical science that studies the cause, nature and effects of diseases) is required to assess dehydration professionally. Dehydration is a potentially life threatening condition. Consult a physician or report to the emergency unit of your local hospital if you suspect dehydration. It is especially dangerous in babies and young children as they have a relatively small H2O volume! Elderly people often show some loss of skin elasticity. A reduction in the water content of the body with ageing is normal. Elderly people should be encouraged to take in enough liquids. A previous burn injury may reduce the skin’s normal elasticity as will ultraviolet damage due to excessive exposure to the sun over many years. Make a habit of protecting your skin against the UV-rays of the sun by using suitable protective clothing as well as protective sun lotions/creams. Encourage the intake of sufficient amounts of fluids during illnesses especially if it is associated with vomiting, diarrhea and fever. Water, diluted fruit juices and special solutions with electrolytes (consult your pharmacist) should be available for these patients. Drinking seawater or even urine in an emergency situation may temporary alleviate thirst but will eventually aggravate the seriousness of the dehydration!